Before you read the thoughts of Janelle, Kathy, Andrea, Ewen and Penelope, you should prepare the right way: in the sixty seconds, whatever you do, under no circumstances should you think of PINK ELEPHANTS. NO PINK ELEPHANTS. Of course, if you are human, your mind was immediately flooded with nothing but images of pink elephants. That is because our brains are hard-wired to react, often emotionally, to certain words or images. The same thing happens when we read words like “free market”, “job creators”, “productivity”, “flexibility” or “competition”, or when we see certain images representing those concepts. Our brains fire off memories and reactions that are burned deep inside us. We often aren’t even conscious of the feeling and emotions triggered by those words or images. Those images and words, then, shape how we think about our world. But, many of the words and images used to describe what is happening in the economy—words and images the traditional media has repeated daily for decades—are built on lies. Those lies make us feel like it’s our fault that we can’t make a decent living. Or that certain things happen naturally in the economy, like the sun rising in the east and setting in the west. Which bring us to this startling fact: 40 percent of Australians—people like Janelle, Kathy, Andrea, Ewen and Penelope—wake up every day working in an insecure job. They are stuck in a cycle of insecure work not because of a lack of “productivity” or knowledge. In plain English, what the authors of the inquiry are saying is this: the Robber Barons running the “free market”—which is just a figment of Tony Abbott’s imagination because there really is no such thing as the “free market”—want to make more money for themselves by keeping money out of your pocket. They want you to work more hours for less pay. They do not want to give you any security—at all. They want all the wealth created by workers to flow into the pockets of a few. This isn’t natural—and it isn’t even good, as we will see, from a pure economic standpoint. This is all about power. It’s about a Gina Rinehart-like greed: a vision of a country where the minimum wage is slashed and, as Rinehart publicly stated recently, workers’ wages are competitive with workers in Africa earning $2 per day. That is the Australia that Rinehart, the richest woman in the world, believes in. To be sure, Rinehart’s “Let-Them-Eat-Cake” posture is extreme. But, it is only extreme because she is not shy about letting the expressions of her inner greed pass across her lips, to be heard by the public. Across the business world, the basic philosophy is now pretty uniform: no permanent jobs, no benefits, no Super, low wages, no sick pay, no annual leave. Instead, the view of business is to push for more people to be in casual work, and to use more independent contractors who cost less to the businesses. It is, at heart, a philosophy that we, business, have no responsibility to workers. We have no responsibility to society or the future of the country. For a lot of people, it’s a bit hard to see because we read that Australia has an official unemployment rate of 5 per cent. Yes, that’s way better than the USA or most of Europe, but what rarely gets discussed is the added underemployment rate of seven per cent. Taken together, then, 12 per cent of Australians want to work more than they currently are. 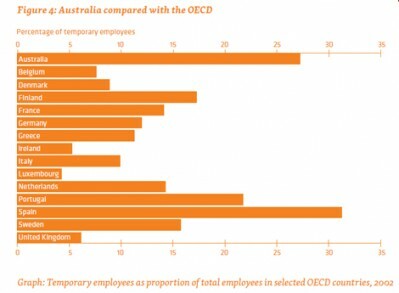 If you, then, add to that the people on a low-wage, short-term contract who are likely to be out of work after a few months, the bottom 20 per cent of Australia’s workforce is stuck in a churn between unemployment, underemployment and short-term work. These people have no job security, any small savings are burned up by periods of unemployment, and they are stuck in jobs that do not increase their skills or make them any more employable. They are trapped on the periphery of our economy, earning a little in boom times, but pushed to the scrapheap when times get tough. These people are not being treated as human beings by the market, but as a disposable labour force. Many do not know what hours they will work from week to week, and often juggle multiple jobs to attempt to earn what they need. If their skills are low, or outdated, they are not offered training through work. They shift between periods of unemployment and underemployment that destroy their ability to save money. Their work is not a “career”; it is a series of unrelated temporary positions that they need to pay rent, bills and food. That life of insecurity should explain to the elites, or the willfully blind politicians or the media commentators why so many Australians are nervous about the future. Even though the most recent unemployment rate dropped to 5.1 percent—a figure that, on its face, should be a cause for celebration if one looks across the ocean at the U.S. and Europe much higher jobless rates—workers don’t feel good about their prospects; thousands have just stopped looking for work because they can’t bear the burden of insecure jobs being shoved down their throats. “It’s really soul-destroying,” she says. Relationships are hard to keep with women; they don’t understand the nature of my work. When I have to wait long periods in between work it causes tension and can’t handle it and leave. I have had numerous relationships failed over the years because of this and now it’s hard for me to be in a serious relationship because the conditioning of instability has become a part of me. “As a casual employee I have no access to conditions like sick leave, paid parental leave, etc. I also have no access to funding to attend things like academic conferences, which are an important part of the academic career progression,” Penelope says. “A large proportion of the academic workforce in Australia are also on casual contracts – either teaching, researching or general staff. I know I’m not the only one, and something really needs to change. “Career prospects are few and far between for someone in my position. I have a PhD but full-time positions are rare and extremely competitive. My current and previous roles (as a tutor and research assistant on various projects) have definitely developed my skills, but there is no clear pathway in terms of training and development that might lead to promotion or progression towards more secure employment. So, how did we get into this mess? In a country where the notion of a secure job and fairness is part of the story one tells about the good life in Australia, how did a cancerous business model spread? A big part of the answer lies at the feet of the transcribers of press releases, the people we once called “journalists”. They have bought, and promoted almost without challenge, a whole set of lies and misinformation: the idea of the glory of the “free market”, the genius of “job creators”, the supposed crisis in worker “productivity”, the need for a company to have “flexibility” in order to win the “competition” for the future and that the high tax level for businesses discourages investment. 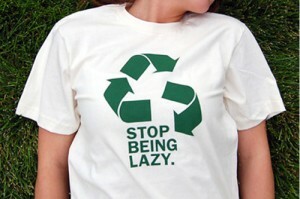 Some of this is just pure laziness. It is easier to just regurgitate slogans or rhetoric, without actually doing the hard work of thinking through what is factual or not. And it’s not even hard work, thanks to an apparently obscure tool called “Google”. For example, in virtually every independent, honest survey of business executives around the world over the past 25 years, worries about tax rates rank far below, for example, access to an educated, skilled workforce, and good transport systems—all of which can’t happen unless a society has a significant tax base. It is the laziness of regurgitating the word “cost” without thinking what it means. Business leaders, and their political mouthpieces in The Coalition, spit out the word “cost” only in what it means in some business plan. But, that word “cost” is a weapon that allows the murder-by-spreadsheet of Australian society. Lowering “costs” in the world of insecure work is aimed right at the annihilation of a middle class, killing the ability of every person to hang on to a modicum of a fair living. 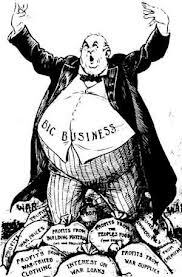 It is the laziness of the media’s slavish acceptance of the phrase “free market” and an almost religious reverence accorded CEOs, particularly when business leaders attack government, taxes or any regulation that is deemed a drag on “competition”. Rare is a moment when a journalist will point out that not one of these vaunted “job creators” made his profit in the mythical “free market” because every dollar was made because of investments made by the government—meaning, us—in roads, bridges, broadband, and schools. By in large, Australia avoided the worst of the Global Financial Crisis thanks to strong government regulation of the banking sector, which prevented Australia’s bankers from mimicking the criminal and irresponsible behaviour on Wall Street. Some of it is the fear, especially in an era when media organs are shedding jobs faster than a long-haired puppy. When everyone around you in the office, and every other media organ, is repeating the idea, for example, that we have a worker productivity “crisis”, it’s scary to go against the tide (though exceptions can be found to the rule: Ian Verrender shredded the lie about the productivity “crisis”—but, of course, his was one column of opinion, outweighed by daily mountains of copy in the news and opinion pages and TV programs bemoaning the “crisis”). Which leads to the prevailing disease of “false equivalency” practiced by the media. That is, if a union points out the attack against workers is eviscerating, based on the facts, wages or secure jobs, the media feels obligated to get “the other side”. The “other side” will wave its rhetorical wand, invoking “productivity crisis” and “competition”, even if the facts don’t support the rhetoric. Yet, the opposing arguments are treated as equally rationale or fact-based. This is “false equivalency” because one side’s argument is based on facts and the other side’s argument is a mountain of lies. Of course, we can’t stick the media with the sole responsibility for the crisis. Unions have not been successful at stopping the insecure work virus. However, what is really refreshing is how forthright union leaders are about the challenge. 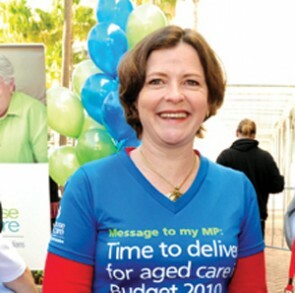 Ged Kearney, the president of the ACTU, is single-minded about attacking the challenge of insecure work to the point of passionate, heartfelt pleading but she starts with the recognition of the union movement’s late response. That’s understandable, truthfully. The union movement doesn’t have unlimited resources and it is hard work just to make sure the people who are covered by industry agreements are looked after. Especially in an era when, day after day, employers seek to break agreements and at least half of the political class—in the form of state and federal Coalition ideologues—want to roll back the Fair Work provisions. One can be assured that if Gina Rinehart decided, on a whim, to donate say one billion dollars to the ACTU to organise these casuals, it would happen much quicker. Now, of course, the notion of a Rinehart-funded union organizing drive is preposterous and lunacy—but only because of the unpatriotic, selfish posture adopted by Rinehart, or a whole coterie of billionaires and elites. No economy can function, and no business can make money, if average people don’t have money to spend. Even Gina Rinehart can only buy so many flat screen televisions, high calorie meals, cars and other goods. As rough a man as there ever was in the annals of global business, US auto czar Henry Ford, used to say he wanted to make sure his workers earned enough money to buy his cars. It is an unchallenged fact that unions ensure people get a fair return on the work they do and, then, have more money in their pockets. Thus, unions mean broad economic prosperity and sustained economic activity. When you get that equation, and you add in the actual experience of Fair Work, you quickly understand that what is driving economic policy is ideology and greed, not economic logic and facts. At the end of the day, economics is not bloodless and boring. It’s actually a question of morality and vision. The path one chooses for an economy is a reflection of who we are as a people. Australia has historically had a unique welfare system, based not on direct payments from governments (except for the Aged Pension) but on guarantees built into the free market itself. We have had an industrial relations culture based on the centralised fixing of wages and conditions to allow a wage earner permanent secure employment at a wage, not set by the market, but set at a level that was seen as fair and allowed for a family to live a decent life. Unions made sure that benefits like sick leave were the responsibility of the employer. The ethos was to celebrate a great degree of social equality within Australia, which, for many years, meant that we avoided the emergence of a working poor, allowed for high rates of home ownership, and it has meant that the majority of people spent their entire working lives without requiring food stamps or payments from the government to provide them with economic security. By contrast, for example, the US recently hit a dubious mark: the highest level of poverty since the government started measuring statistics fifty years ago. But, it’s now Gina Rinehart’s vision of the world: the welfare safety net that was wrapped up in our industrial relations system has been lost. Casual workers now have none of the protections that were once guaranteed, and no government-funded safety net has sprung up to fill the gap. We are seeing, for the first time in Australian history, the emergence of a working poor. We are seeing a level of inequality which would have been quite alien to Australians of a couple of generations ago. The response from Coalition governments, in particular, has been to implement policies that subsidise those wealthy enough to afford private health or education, which will only further entrench these inequalities. Even the compulsory superannuation scheme, a forward thinking piece of public policy, delivers benefits to workers based on their ability to pay into a fund, rather than the equal payment to all guaranteed by the Aged Pension. 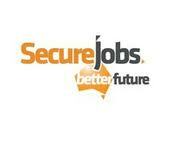 Insecure work, then, is a challenge to define what kind of Australia we want. The choice is crystal clear: either the future ends up adopting the Gina Rinehart vision of slave wages, no middle class, a growing gap between rich and poor and a society where all the power is in the hands of the elite and business owners. Or we choose a democratic society in which the wealth of the nation is shared fairly and where real security means workers of every age, gender and different backgrounds have power over their lives, waking up every day knowing that, when they walk out the door of their homes, they are going to come home paid for a fair day’s work at a job that awaits when the sun rises the next morning. Here is an undisputed truth: All of life can be explained either by The Godfather or Star Trek. Period. Full stop. Which brings me, logically, to the rising Aussie stock market. The Australian sharemarket has closed higher as local investors took heart from better-than-expected economic data out of the US and an improved outlook for the troubled eurozone. The benchmark S&P/ASX200 index was up 45.0 points, or 1.1 per cent, at 4172.2 points, while the broader All Ordinaries index had lifted 47.4 points, or 1.1 per cent, to 4213.8 points. CMC Markets senior trader Tim Waterer said the Australian market had followed a positive lead from markets in the United States. Yes, if you are retiring today, then, your Super is looking a bit better–until the next financial crisis hits…But, there is a reason people feel uneasy about the future. If you’re finding it hard to pay the rent, or make ends meet, a soaring stock market is really a false God–and, in many cases, a higher market is driven by a bunch of gamblers gaming the system (more on that down the road). How many times have the transcribers of press releases (formerly known as “journalists”) in the business press reached orgasmic rhetorical heights–anyone remember the predictions of the Dow Jones reaching 30,000? I do–only to write the very next week in sour, deep disappointment when the market comes plunging back to earth because, surprise, bankers didn’t bother counting all the bad mortgages they had on the books. Oooooppppssss! Because, like Star Trek, a lot of the stock market is fantasy. It’s built on a house of cards of psychology, not reality. And, reality, in the lives of most people, is what they see in their paycheck and in their bank balances. And what’s left at the end of the month when the bills come due. At the very least, we should demand that every report about stock market gains or other business-driven data includes what the Australian Council of Trades Unions points out: that 40 percent of Australians are in insecure work. Because long after the stock market bursts or flies higher, and long after Gina and the other mining robber barons each pocket an extra billion dollars while whinging about paying just a smidgen more in taxes, and long after the Empty Suit leader of the Coalition exhausts his fear campaign over carbon pricing–long after all that millions of people still won’t be employed in jobs with secure futures. Or, as Captain Kirk might say, the Prime Directive (if you have to ask, Google it) in a decent society should always be guaranteeing prosperity for all, not capital gains for the few people lucky enough to be riding the wave when the market soars. Concern over job security has risen slightly since the last time the question was polled, increasing 2 points up from 47% in October 2011 to 49% (total concerned). In the 12 months from April 2011, total concern has increased from 43% to 49%. Coalition voters are the most likely to be concerned that they or a member of their immediately family will lose their job in the next year or so (55% total concerned), whereas Greens voters are less likely to be concerned (34% total concerned). There were no major differences across income or age groups – except for the under 25’s where 41% were concerned and 48% not at all concerned.